If you have just moved into a new home in Burlingame, California, or are thinking of renovating your home, you will need to start thinking about the type of garage door that you want put into place. A big part of this is the specific type of Burlingame garage door openers on the market. Belt drive, screw drive, and chain drive are the three main options, all of which have their own pros and cons. It's best to speak to our professional contractors for advice to choose the best one. Safety is guaranteed to all people trusting the services of our company. With the capacity to help residential customers in timely fashion, equipped vans and years of field experience, the technicians at our local business are able to take care of garage door parts whether they are broken or simply need lubrication. We replace components but also the opener and overhead door, install every new product properly, and are here to provide emergency same day service. When the door is jammed or doesn't move due to opener issues, our technicians guarantee a fast response along with immediate repairs. 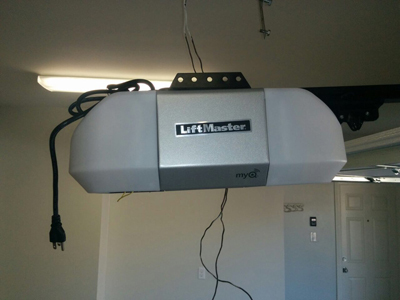 From sensors repair, wiring replacement and Liftmaster door opener service to panel repair, spring adjustment and garage door installation, our company is here to make your life easier, convenient, and safer. As stated above, the chain drive, belt drive, and screw drive are the top three options in this department. There are advantages and disadvantages associated with each. It's helpful to set a budget in advance, to narrow down all of these options. The cheapest type of garage door openers in Burlingame, for example, is the chain drive. Yet at the same time, it is the noisiest option, because it involves a metal chain being used to lift the garage doors along their tracks. The belt drive is quiet, and can be ideal for those living in close quarters with their neighbors. The downside for some people is that this option can be more expensive. Screw drives are popular alternatives to the other two types of openers, because they are somewhere in the middle in terms of price and noise.